Convo is a tactical squad romance about applied linguistics and binge drinking. I remember when I was of legal age (okay, well, of kinda somewhat legal age) and I started going to bars. Who teaches you how to behave at a bar? How do you know how much to tip a bartender if at all ("$1 a drink, usually, in the US") or what tabs are ("you pay when you leave") -- is it weird if you're there by yourself? (Sometimes.) When do you buy a round for everyone? (Sometimes.) When is it okay to check your phone? (It depends.) There are all these rules of socialization that we internalize without thinking, practicing them until they become reflex. 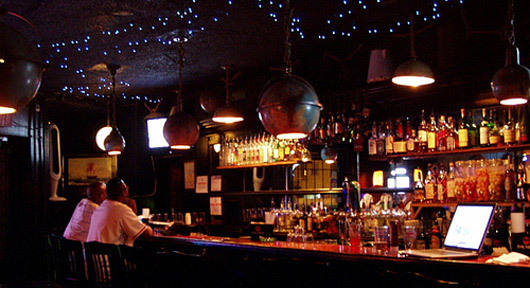 Different bars in different places have different rules, and we wordlessly sensitize ourselves to each arena. But even before we enter bar culture, we get socialized at a much more basic level -- in the art of conversation. How do you know when it's your turn to talk? When can you make a joke? When can I leave a conversation? My prototyping process has involved a lot of linguistics research along these lines, mainly focusing on an old (now somewhat irrelevant?) branch of applied linguistics called "conversation analysis." It might be really hard to teach an AI just how to time its responses and get into the rhythm of things, but there are 5 year olds who effortlessly achieve gapless conversation on a daily basis. I find that fascinating -- and where there's elegance and an element of timing, there's strategy and a game. To be clear, my goal isn't to solve "procedural conversation generation" in any way, but rather to sidestep it. Convo is NOT about "what" you say or "how" you say it -- it's mostly about "when" you say it. I'll post more about Convo as I develop it. I've turned my No Show Conference talk into a 3-part essay series for Rock Paper Shotgun. 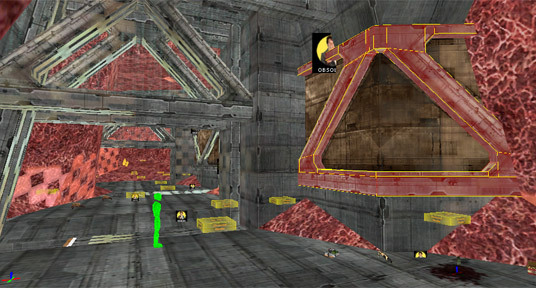 It argues for a long-standing but suppressed tradition of non-industry involvement in the first-person genre, and that the nascent "renaissance of the FPS" isn't really that recent. Instead, we mentally blocked out the "innovation", then complained why there wasn't any innovation. 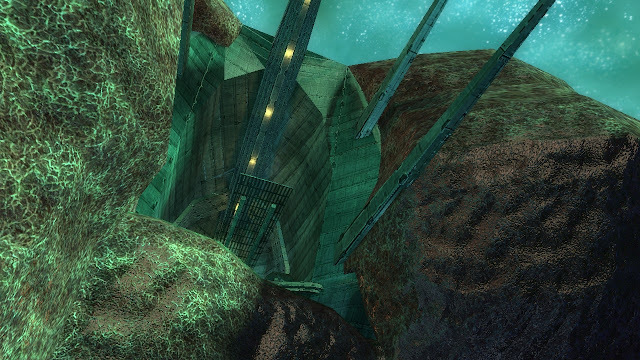 Part 1 talks about the Doom WAD scene and the murder of Myst. Part 2 argues that FPS mods were a way to break into the game industry, so we had to think like the industry too, even if it was dysfunctional / self-destructive for us to do so. Part 3 observes that many people mod today without any regard for an industry job, and the career path for post-amateur modders is now unclear because of the indie scene. It also argues that many mods are now "postmods" in that they don't care if they ever get played, among other reasons. Public service announcement: Anna Anthropy has written a great short tutorial on making games using Twine -- it's perfect for people with little or no game development experience at all, and will allow you to make cool text-based games with choices and stuff. "Do you think shooters take themselves too seriously?" If you're actually serious about war, then military shooters get 99% of it wrong. The US fights wars with unmanned drones, viruses, trade embargoes, and giant bases they airlift to the middle of Afghanistan. More significantly, they these games argue war is something inherently winnable, to some degree, through personal agency. The video game depiction of war is so misleading that we have to consume it as fantasy. So, instead, I think modern military shooters are best understood as Hollywood blockbuster action movies. If we think about it like that, Die Hard takes the geography and materiality of the setting (the mechanics of action) VERY seriously -- in the beginning, Bruce Willis' character takes his shoes off to relax his feet on carpet because he's a stressed-out NYPD cop, but then later he has to walk on broken glass with his bare feet, which has consequences. The movie spends a lot of time on this, and makes sure the line of causality and punchline for the bare feet are all consistent and feel earned... but it spends all of 2 minutes dwelling on the thematic backdrop of terrorism and Japanese-American corporate culture. 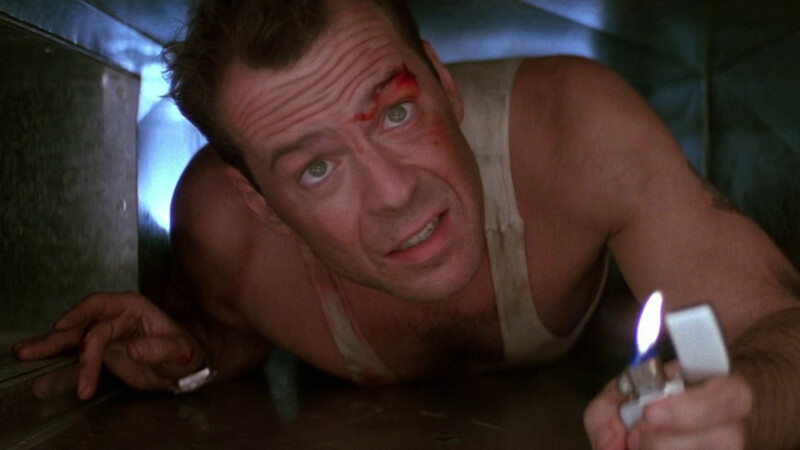 Bruce Willis is charismatic and human enough for Die Hard to work like this. UPDATE, 19 June 2014: I've given up on this and I've open-sourced the project files. I'm approaching my Someplace Else port to Source very differently from how I approached my early work on the Anomalous Materials chapter of Black Mesa Source. There, I felt I had significant license to add rooms and change architecture styles. Because Someplace Else is so combat-heavy, it feels strange to do that. Anything beyond higher resolution textures, new shaders, and more surface geometry requires justification, which means studying what Foster did and extrapolating what he would've done with more resources and higher memory limits. In the history of level design archaeology, I think the most convincing piece of writing has been Channie on the laundry room in Favela from Modern Warfare 2. I don't think I'll be able to achieve such certainty about something, but it'll be fun to think about. So after coming back from Europe last month, I thought about why I haven't been good at finishing things these past few months, and I've decided to try making something different in a different way, and to see how well that goes. That means no first person, no reliance on written narrative, no vast architectural worlds, and no "art + writing first" approach, which is what I've been doing (with varying degrees of success) for the better part of this year. 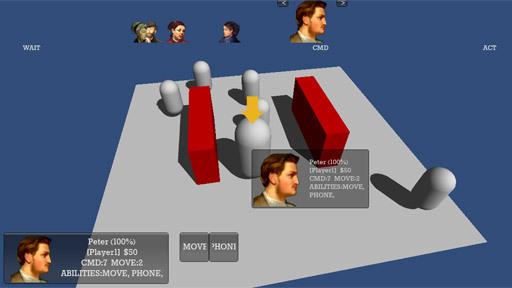 Convo is a squad tactics game about linguistics and binge drinking, and I'm working on systems / interface first... I've never paid so much attention to UI before. I have a few ideas as to how to structure the narrative and such, but I'm avoiding anything resembling implementation right now. Roughly, I'd say it's based on the notion that a game narrative's job is to emphasize and/or problematize a game's simulation gap. Someplace Else: Source is a Source remastering of Adam Foster's Someplace Else, in anticipation of Black Mesa Source's impending release and the 5th anniversary of Minerva: Metastasis' release. If you're interested in partnering for Minerva Day in some form (fan art? photography? sculpture? design criticism? fan fiction? etc.) then please get in touch. I'm also in the middle of writing a three-part series of essays for Rock Paper Shotgun. It'll probably appear in about 2-3 weeks, and the whole thing will get published across a single week -- so lucky you, not much waiting involved. I always thought art deco was a strange choice for Thief 2 to pull from. Architecturally, they started from medieval and skipped right past baroque, art nouveau, neogothic, and victorian styles, which always seemed ripe for use in a steampunk urban setting. Thief 3 channeled some straight-up gothic as well, which was disappointingly generic. Wouldn't these other, more sculptural styles, show-off your fancy newfangled normal mapping tech better than some boring brick insets? 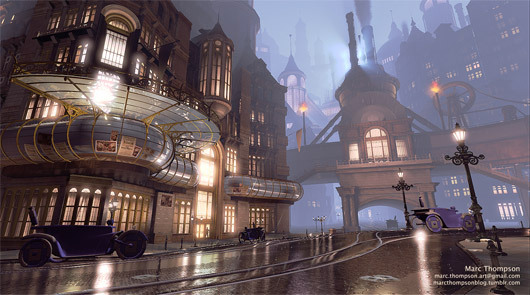 Oh well, here's hoping Thief 4 fares better -- Thompson offers a convincing glimpse of what a next-gen shiny victorian style might look like in a contemporary engine, with some really great use of fog.